A Pan Niger Delta, Socio/cultural group, the Esan Peoples Movement of Niger Delta, EPMND, has expressed full confidence, that despite the desperate efforts of Governor Adams Oshiomhole and the All Progressives Congress, APC, in Edo state, to subvert the political will of the people of Edo state, the Peoples Democratic Party, PDP, ticket of Pastor Osagie Ize-Iyamu and Hon. 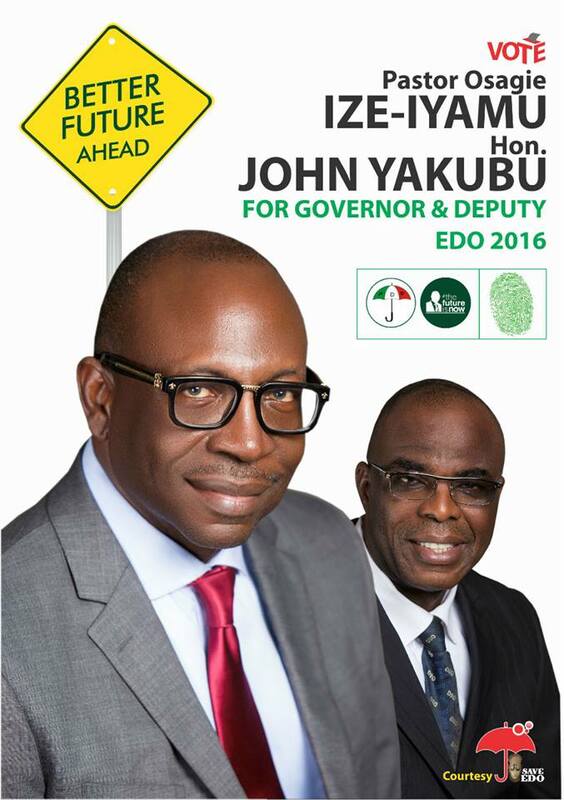 John Yakubu, will win the re-scheduled Edo state Governorship election on September 28, 2016. Speaking against the backdrop of a host of incidences that have transpired since the announcement of the postponement of the Edo Guber Polls from September 10 to September 28, the group in a statement jointly issued by its Chairman, Augustine Eriaremwhen Oboh and Secretary Mrs. Benedicta Ozidede, said that given the groundswell of endorsements from prominent Edo indigenes, revered traditional institutions, established professional groups and diverse organizations and associations across the state, for Pastor Osagie Ize-Iyamu, coupled with the decamping of thousands of former APC members to the PDP, the victory of the PDP, which was already assured, has now been further consolidated in this period of postponement and the people of Edo state were now fully prepared to overcome the devious plot by the APC to truncate democracy in the state. The group, which lauded the excellent performances of Pastor Osagie Ize-Iyamu, not only on the campaign trail but indeed during the Governorship debates, where he clearly articulated and presented his plans and governance agenda for the enduring development of Edo state through the brilliant SIMPLE Agenda, noted that any doubts which may have still lingered in the minds of some Edo people about the commitment of POI to take Edo state to greater heights, have now been completely allayed and confidently addressed to the satisfaction of all, adding that Pastor Osagie Ize-Iyamu has shown that he is prepared to give Edo state progressive leadership which will carry all Edo Indigenes and citizens along, without discrimination or favoritism. While frowning at what it described as the diversionary attempts by Governor Adams Oshiomhole to drag the Delta and Rivers state Governors into an unnecessary smear campaign, the Esan Peoples Movement of Niger Delta, hailed the brilliant performances and developmental strides of both Governors Ifeanyi Okowa and Nyesom Wike, especially in the robust infrastructural development of their states and in addressing the welfare needs of their people, including the regular payment of workers salaries, under the present harsh Economic situation in the country and advised Governor Oshiomhole to realize that the APC government has failed Nigerians and it was time to give way to those who are prepared to take up the mantle of leadership with a proper plan to govern the people, instead of with cheap lies and propaganda. The group, which described the dramatic postponement of the Edo Guber polls as a sad development for Nigeria’s democracy, chided the Independent National Electoral Commission, INEC and Security agencies for contriving such a flimsy excuse and urged them to respect the will of the people of Edo state and contribute positively towards the deepening of democracy in Nigeria, by ensuring that they redeem their image and win the trust and confidence of Edo people and Nigerians, by conducting a free and fair election, where the will of the people will be upheld and accepted, through their votes, come September 28. The Esan Peoples movement of Niger Delta then charged Edo people to be vigilant and law abiding, even as they monitor the distribution and movement of electoral materials on election day, to ensure any effort to tamper with the process is strongly resisted and while calling on all eligible Esan indigenes both at home, abroad and especially in the Niger Delta, to use the opportunity of the re-scheduled elections to return home, mobilize and vote for the governorship team of Pastor Osagie Ize-Iyamu and Hon. John Yakubu, expressed its unshakable confidence that the PDP has the welfare and interest of Esan sons and daughters at heart and will deliver the dividends of democracy to Esanland and Edo state as a whole, after their victorious emergence from the September 28, 2016 Edo state Governorship election.